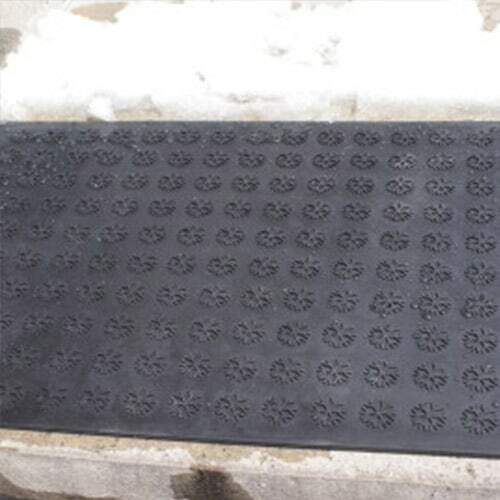 HOT-flake Heated Mat | Quality of Life Products | KEMF Inc.
Canadian designed, HOTflake™’s anti-slip, inter-connectible heating mats are manufactured in 100 percent virgin, moulded SBR rubber. 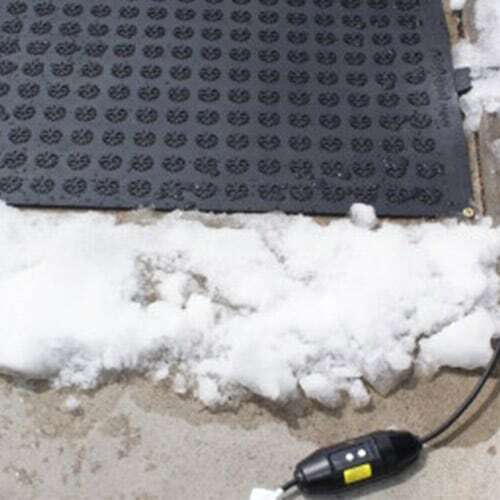 The patented, waterproof heated wiring embedded within the mats melt snow and ice ON CONTACT, thereby protecting you from slips and fall accidents. Our versatile HOTflake™ mats are perfect for residential and commercial use. Distinctly manufactured in standard mat sizes promoting simplicity in design, clients can easily and safely interlink and configure them to create their ideal individual applications and layouts. Even when inter-connected, the mats can still be regulated using snow sensor controls, timers, thermostats, or even remote controls. Both HOTflake™ heating mats and HOTblocks™ outdoor heated mats for industrial use incorporate waterproof cable screw connectors for secure connections between units, providing optimal safety and efficiency. The weight of the mats and stair treads, combined with their anti-slip underside design, prevents shifting and sliding and keeps the mats securely in place. If needed, grommets have been incorporated in the corners for clients that need to screw down the mats. HOTflake™ offers GFCI units (ground fault circuit interrupters) for additional safety, and to conform to TUV specifications as well as UL and CSA certification. The mat can connect up to 10 (120V) or 20 (240V) rubber stair treads, up to 5 (120V) or 10 (240V) rubber doormats and landing mats AND up to 4 (120V) or 8 (240V) walkway and driveway mats. In any combination, connections should not exceed 15 amps per GFCI. HOTflake™ heats up between 7 – 10 degrees Celsius or 44 – 50 degrees Fahrenheit in five minutes! Our heating technology offers home and business owners an effective way to eliminate slippery walkways and stairs on all types of surfaces including asphalt, stone, wood, cement and grass. HOTflake™ mats are easy to transport and require no particular installation. 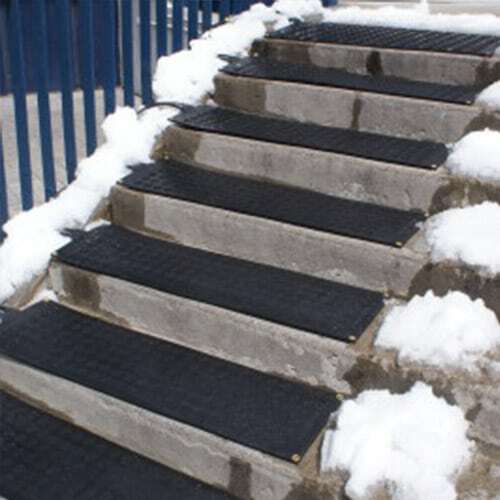 HOTflake™ is ideal for keeping access ramps for wheelchairs, entrances to residences for the elderly, hospitals, government or public buildings and office buildings clear of snow and ice. HOTflake™ heating mats ensure the safety of seniors, mothers of young children and the physically challenged during winter weather. 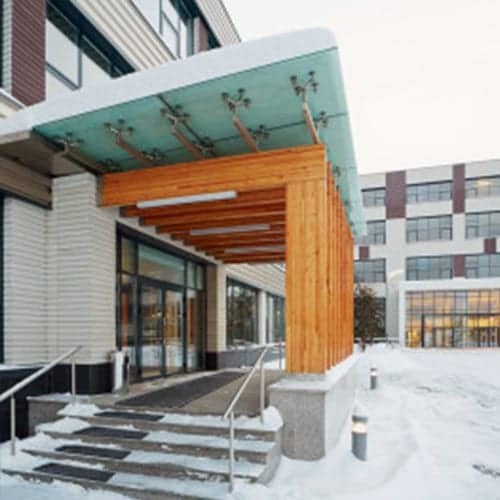 They configure easily to cover employee and public entrances to hotels and ski centres. Use them on the walkway leading to the sauna, spa, barbeque or patio. The mats are perfect for all steps, doorways and walkways! They are even solid enough to be used for cars on driveways! “It is now possible to clear walkways, entrances and stairs of dangerous, slippery conditions without the use of salt or sand. Water will not accumulate but will flow off or evaporate.” – Mark Fryml, inventor of HOTflake™ design technology. KEMF Life Simplified Inc. also offers the HOTflake™ foot warmer indoor heating mat. HOTflake™ outdoor anti-slip heating mats—no more shovelling or back pain! Please contact us with any questions or concerns.